Welcome back to Tribal Apocalypse, the PRE where we're dreaming of a white, blue, black, red, green, and/or colorless Christmas. Basic Gift Package: 100 cards on Pennybot and 1 Mythic Rare from SBena_Bot just for including at least one green Plant in your deck. Medium Gift Package: 200 cards on Pennybot and 2 Mythic Rares from SBena_Bot if you also drop your Plant on the battlefield during the event. Deluxe Gift Package: 300 cards on Pennybot and 3 Mythic Rares from SBena_Bot if you complete 2 and your Plant actually resembles a tree. The available Mythic Rares are all creatures, all multicolored, and all nice and playable (so, no, Malfegor isn't among them). You'll get to choose which ones to pick, starting in reverse order of final standings (meaning: the less successful eligible players will chose first). Now, I've been asked by multiple players: what Santa Kuma will consider "resembling a tree"? I had planned to make the call on the moment, but since you're such rule-obsessed, here's the answer, and also a special variant: the Plants resembling a tree are just these four: Singing Tree, Tree of Redemption, Utopia Tree, Tinder Wall; but in addition, you can also play any singleton Treefolk (singleton only, mind you!) in a non-Treefolk deck, and it'll be eligible to any of the gift levels, even if it's not a Plant (because, well, it is). Ho ho ho! So, Gq1rf7 (who I had interviewed a few weeks ago) took his 3rd win in the space of 9 weeks, achieving Top 8 status for the first time. And another Hungarian player happens to be the one I interviewed this week for my Five Questions thing: I'm talking of milegyenanevem, who celebrated his first victory in the previous event, after a long, solid frequentation in Tribal Apocalypse. Go Hungary! And after his Assassin digression, Gq's success was again due to the always reliable Goblins, once again the protagonist of a super budget-friendly build. And the guy who tried and stopped the red menace (albeit to no avail) in the final showdown was another old acquaintance of Tribal Apocalypse. 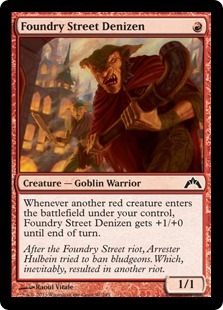 Or two, actually, since that description may apply to both arcbounddaylabor and the classic Kithkin tribe, this time in a version chock-full of clever meta-call cards like Disenchant, Suppression Field, and Burrenton Forge-Tender (although, ironically, the only red deck he met in the entire tournament was the Goblin one against which he lost). On the unconventional side of things we had this Spirit build by Kingritz, whose only goal was to collect as much achievements as possible. You can see its insane combos in action in this week's Show and Tell. As for me, I wanted to exploit the last chance to take my beloved Simic Snakes for a ride during the very appropriate Year of the Water Snake (actually it might not be the last one, since the Chinese New Year begins in February, but oh well). It's the same Snake ramp powered by Sachi and Lotus Cobra that I had already used with some degree of success, including a 1st place earlier this year, after RexDart also piloted it to a win in the very first event of 2013. This time I opted for a more straightforward and in-color endgame – even considering that, in the aftermath of my Collection Selling Event, I don't currently own any proper dual land anymore – going for the green power couple of Hornet Queen and Craterhoof Behemoth as the Snakes' little helpers. On top of the always welcome Daddy Seshiro. You can see I've 24 trampling damage on the board vs. arcbounddaylabor's 4 cumulative toughness and 20 life total. But I figured he could have another removal in hand, thus surviving the attack and counter-alpha-striking me for lethal the following turn (plus, I was able to follow up with another Craterhoof Behemoth – for the next two turns if necessary). Instead, he had Brave the Elements, which I never saw in the previous games. I still believe my choice was not terribly wrong, but in hindsight, yeah, I should have attacked in full force and call it a day. You can see the entire game in Show and Tell below. Another record is set in the field of frugality for the Goblins, with Gq1rf7's build having become even cheaper than in its previous, equally victorious outing. Now Gq holds 4 of the Top 5 positions in the Cheapest Undefeated lists. It happens when you play a deck whose average card is worth 6 cents. And the Kithkins could be almost right there with them (even the former walletslaying Figure of Destiny is now cheap enough, thanks to the extreme popularity of Modern Masters), if not for that couple of Mutavaults that make for more than 80% of the entire cost of the deck. The M14 reprint didn't help much, as the Changeling Land skyrocketed again and is still sold at more than 25 tix apiece. 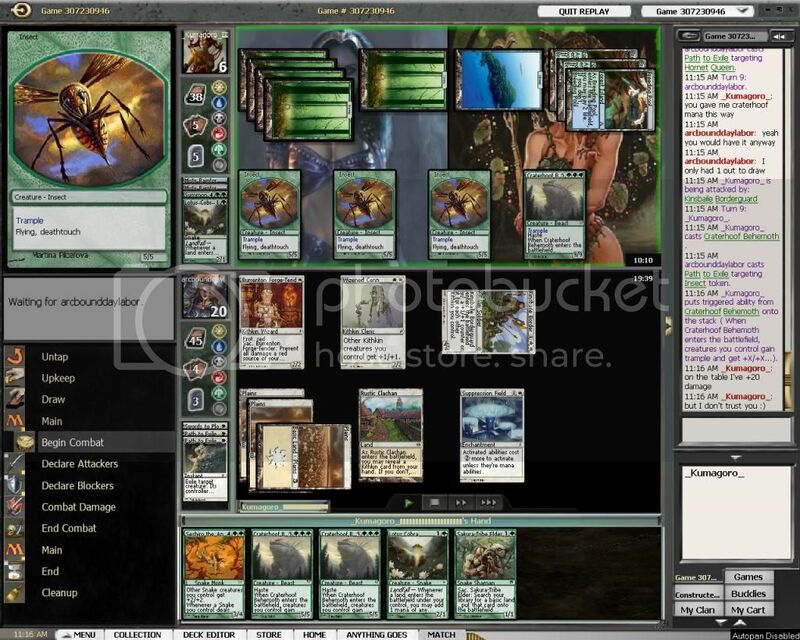 Here's the wacky game where Kingritz (against sparring partner Edison_88luckyplayer and his Slivers) uses Panoptic Mirror and Savor the Moment to buy himself the time to do such crazy things as dropping all the Myojins onto the battlefield, putting 20 counters on Darksteel Reactor, and taking 10 out of Dark Depths, only to populate the Marit Lage token. That's achievements, baby. And this is the game my Snakes ended up losing against arcboundaylabor's Kithkins after my half-assed alpha strike and their surprise counter-assault. Ouch. WHO: My real name is Dániel Gerbner. 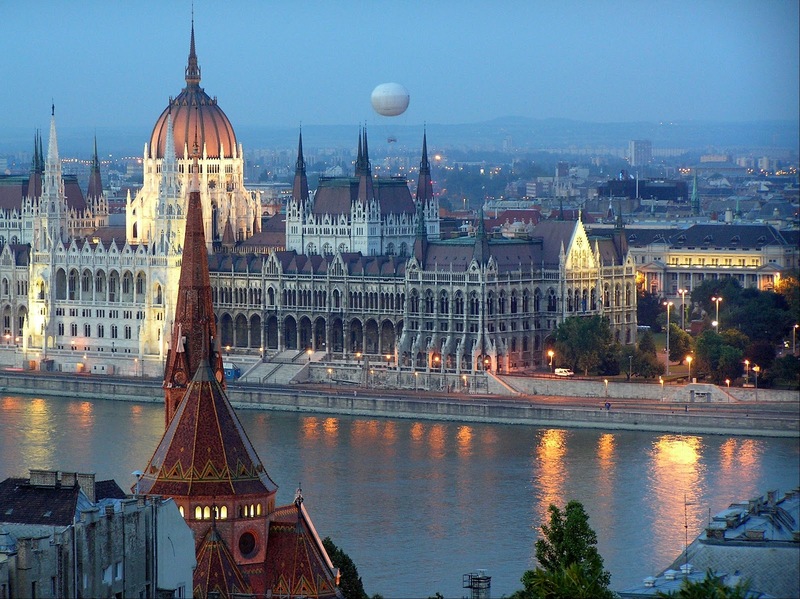 I'm a 33-year-old mathematician from Budapest, Hungary. "Milegyenanevem" means "whatshouldbemyname" (in Hungarian, "Mi legyen a nevem?"). When I first had to choose a username for something, I didn't have any particularly good idea, so that is what I chose, and have used since then. It generated an awkward situation when I had to tell my username IRL once ("What's your name?" "Well, what should be my name?". And the guy didn't understand what was going on). On the other hand, other Hungarians can recognize me on MTGO. WHAT: I prefer variety. My ultimate goal is to play every tribe at least once. A couple months ago I went through the alphabet and for every letter I played a tribe starting with that (except for Q, because there's no such tribe yet). However, I usually don't have enough time to build decks. In fact, I usually build them in 15 minutes before the event. This was the case with my winning Satyrs as well. Let me describe how I build a deck in 15 minutes. The hardest part, of course, is to choose a tribe. I just look at the tribes playable that day and look through my cards. Once I found the tribe, I pick the tribal base. This time, Boon Satyr and Voyaging Satyr were obvious choices, and some number of Wild Celebrants as well (KUMA'S NOTE: This latter choice is what doomed my Vedalken deck in the finals, as documented in the last installment). Usually I try to avoid playing changelings, but the ramping by Voyaging Satyr paired nicely with the Chameleon Colossus. I filled the rest of the 20 with some other Satyrs. I knew I would play some Swords, so the trample on Satyr Rambler seemed useful. Then came the land base. I went through all my lands and picked the better green-red ones. Gruul Turf was necessary because of Voyaging Satyr's untapping, and at that point Temple of Abandon became reusable. Then the remaining parts: The main reason to play Satyrs was that I owned 2 Xenagos. 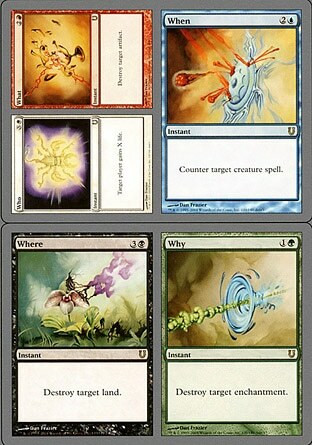 I was in red, so a playset of Lightning Bolt was a given. There was no reason not to run the usual Swords, one of each that I own. I wanted to ramp from 2 to Colossus mana, and looking at my lands Farseek seemed the obvious solution. And since I was ramping, Clan Defiance looked good, and with 8 mana sinks I decided to try Thran Dynamo. I did not expect for the deck to perform any better than usual. Sure, the mythics should win some games, but the tribal base is less than stellar, and the Dynamos were more like an experiment. In fact, all 4 matches ended 2-1. In the video below you can see the 3rd game of the first round where I got close to losing the match when Gonzzy (who was playing Troll) ultimated Elspeth. This time the combination of Kessig Wolf Run and Chameleon Colossus saved the matchgame, but Clan Defiance, Xenagos, the Swords and the Wild Celebrants all won me games. WHEN: I started playing at high school, around the time Revised was released. I played strictly casual, and stopped when I finished high school. Then I returned to the game with a couple high school friends to play at prereleases. It got a little bit more serious when I couldn't go to the SOM prerelease, so I went to another SOM sealed event and ended up in the Top 8 at a PTQ without even knowing what the Pro Tour was. The Top 8 was my second draft ever, and it didn't go well. I still only play limited IRL, but I even traveled to a couple GPs, including a 53rd place at Milan in 2011. I started playing MTGO in March 2011. I planned to play some matches just for fun, but then I discovered the Player Run Events, and now I spend way more time in MTGO than I should. WHERE: I like every format. In paper I only play limited. The reason is not simply the price, more like the difficulties of managing a collection. On MTGO I mainly play limited and PREs (everything in European-friendly time). I don't play in constructed dailies, because of my budget. I don't spend any money on MTGO. I use only what I win in the PREs and I trade, hence my collection is improving. I could sell several cards and buy a top tier deck in almost any format, but I'm a collector at heart, so I have lots of crappy cards instead of a couple good ones. Similarly, I don't buy cards for Tribal Apocalypse events (except once, when I wanted to play a tribe with J, and didn't have enough Jellyfishes). WHY: My two favorite PREs are MPDC (Monday Pauper Deck Challenge) and Tribal Apocalypse, and my approach to them is totally different. On MPDC I follow the metagame and always play the deck I think it's the best (I Top4-ed with Gateflicker 10 times in a row), but in Tribal I like trying whacky decks. I don't exactly "brew", I just try out different things. The Hamtastic Award: The Biodiversity Prize dedicated to the memory of Erik Friborg has started again, for its 8th edition: be the first to run 10 different tribes in a row and you'll get 5 tix on SBena_Bot! You have to play all the rounds of an event in order for the tribe to be added to your sequence. If you repeat a previous tribe, your whole sequence resets. Current leaders: AJ_Impy with 9 tribes played, 1 to go.